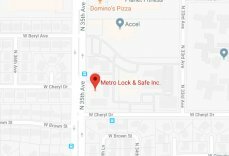 5 Simple Ways to Protect Your Home and Business from Burglars | Metro Lock & Safe Inc.
Posted on November 13th, 2012 by Metro Lock & Safe Inc. While sophisticated video surveillance, security and alarm systems can be effective deterrents to prowling burglars, it is also important to pay attention to the little things that you can do to make your home and business burglar proof. Here are 5 simple tasks you can do yourself to protect your property. 1. Install Window Locks – It doesn’t take long for someone to pop out a window and enter your home or business. Even windows with traditional latches on them are usually no match for an experienced burglar. There are many companies that offer special locks that you can install on your windows, regardless of whether they are a sliding or double hung style. 2. Light – Thieves and prowlers work by stealth, and the last thing they want is attention. You can encourage them to look elsewhere by installing lights around your home and business that turn on with motion sensors. 3. Trim Vegetation – I drive past homes all the time where the windows are completely hidden behind a large hedge. This is a sure attraction for burglars. Take the time to trim down the vegetation around your business or home’s windows and entry areas. Make sure that your access points are easy to see from the street and from neighboring property. 4. Window Blinds – Undoubtedly, you have driven past homes at night and seen their windows wide open, displaying expensive electronics and other valuables. If you can see these things, a burglar can too and sometimes, they employ these methods to find their next target. Window treatments, or blinds, are relatively inexpensive and will keep out prying eyes. 5. Use Timers – Burglars will look for an easier property to break into if they have the impression that someone is home, or perhaps working in the office late. Timers are another cheap, but effect burglary protection. You can attach them to radios, lamps, or outdoor lighting so that they come on before night falls.